Jared pushes Gracie's wheelchair down the field to the fifty yard line. The seniors, both born with down syndrome, were in the same spot one week ago. 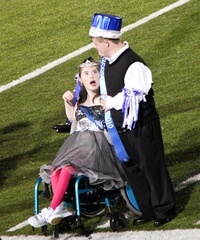 Their fairy tale began days before when their classmates nominated them for homecoming king and queen. "He started out at home wearing a bowl on his head," said Charlotte Friemel, Jared's mother. "And then from there the school made him a crown." Jared and Gracie were each up against 45 other students, so Jared launched a campaign to make it to the next round. "He walked around with a sign that said 'Vote for Jared' with a crown," said senior Shelby Phillips. Gracie, who cannot speak, won votes with her contagious smile. "Her smile is not just a gift, it is a total miracle," said Erin Kiltz, Gracie's mom. At age two Gracie was diagnosed with the most aggressive form of leukemia. After ten rounds of chemotherapy her heart stopped beating for 20 minutes due to bacterial infection. Doctors thought she would not survive the night. She suffered brain damage that took away her ability to eat and smile. Doctors said she would never be able to do either one again. Last Friday night, Jared's parents escorted him down the field after his name was announced on the loud speaker. The crowd went wild. Gracie and her father were close behind. You can probably guess what happened next. Both were crowned king and queen. The stadium rose to their feet clapping and crying. "Friday night was just such an 'ah ha' kind of moment," said Erin. "Like yes, these kids get it. They really do see the contribution these special students have to give and to make in our world." Jared has been wearing his crown ever since. Part of the glory goes to a program at GHS called Peer Buddies where typical kids interact with special needs students on a regular basis. Shelby Phillips and Lesli Dockal are involved, and helped spread the word about why Jared and Gracie needed to win. "Instead of voting for a cheerleader we vote for someone who really deserves it and who really appreciates it," said Shelby. They are finding out the fame can be tiring, but when it fades away, the feeling will have lasting effects. "As a parent you always look at 'what is my kid going to add?' so I think at this point he's added as much value to their lives as they've added to his," said Charlotte.